Associate professor of art Barry Perlus responding to the work of Richard Zimmerman (M.F.A. 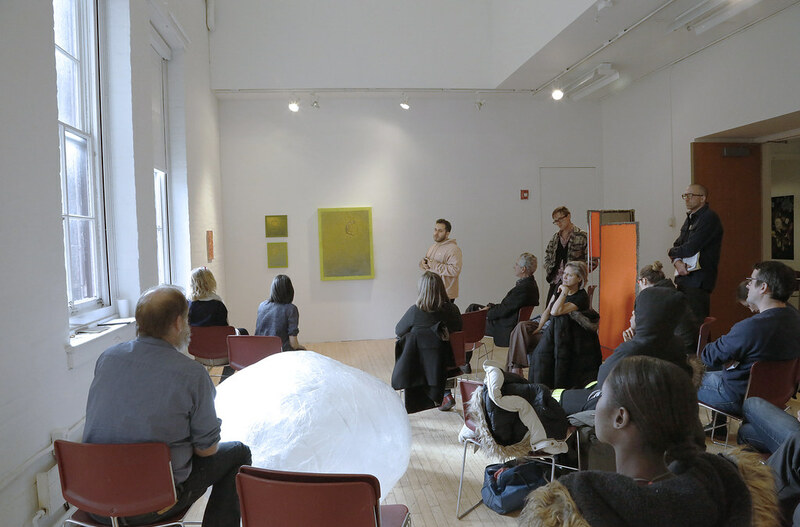 '18), during the all-faculty critique of the M.F.A. group show AFter karaoKE. 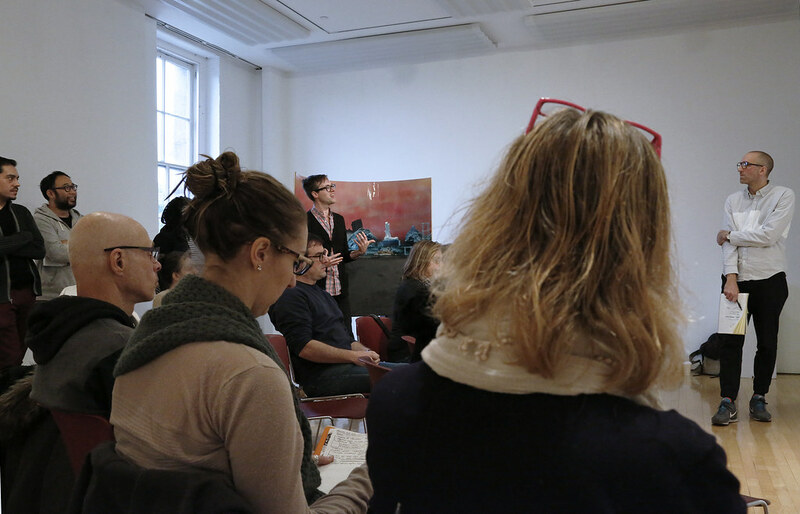 Department of Art Visiting Lecturer Christine Elfman during the M.F.A. all-faculty critique in Tjaden Gallery. Kaleb Hunkele (M.F.A. '18) presents his paintings during the M.F.A. all-faculty critique. Associate Professor and Director of Graduate Studies Carl Ostendarp discussing the sculpture of Madeleine Cichy (M.F.A. '17) in the Experimental Gallery. Na Chainkua Reindorf (M.F.A. '17) presenting at the M.F.A. all-faculty critique in Tjaden Gallery. Clayton Skidmore (M.F.A. '17) responding to Kaleb Hunkele (M.F.A. '18) in the Tjaden Gallery. Jerry Lim (M.F.A. '17) responds to photographs by Sasha Phyars-Burgess (M.F.A. '18). Department of Art Chair and Associate Professor Michael Ashkin critiques the work of Madeleine Cichy (M.F.A. '17) in the Experimental Gallery. Gabriel Ramos (M.F.A. 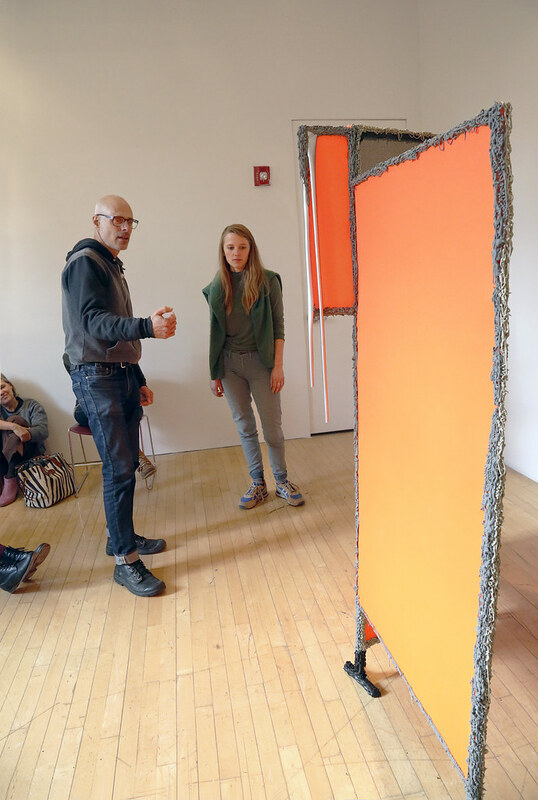 '18) discussing his work in the Experimental Gallery. Diana Clarke (M.F.A. '17) presenting her work in the Experimental Gallery. Alex Jahani (M.F.A. '18) presenting his paintings in the Experimental Gallery. 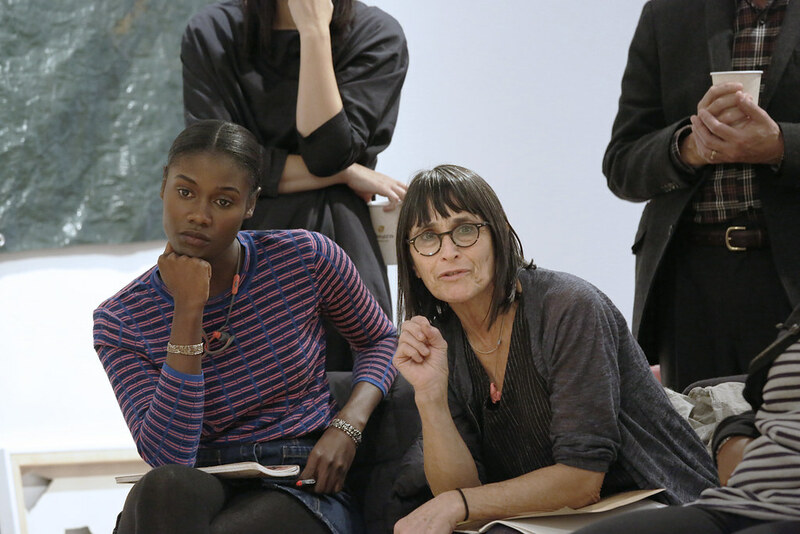 Department of Art Visiting Lecturer Linda Norden, at right, during M.F.A. presentations in Tjaden Gallery. Kate Huffman (M.F.A. '18) with her painting in the Experimental Gallery. 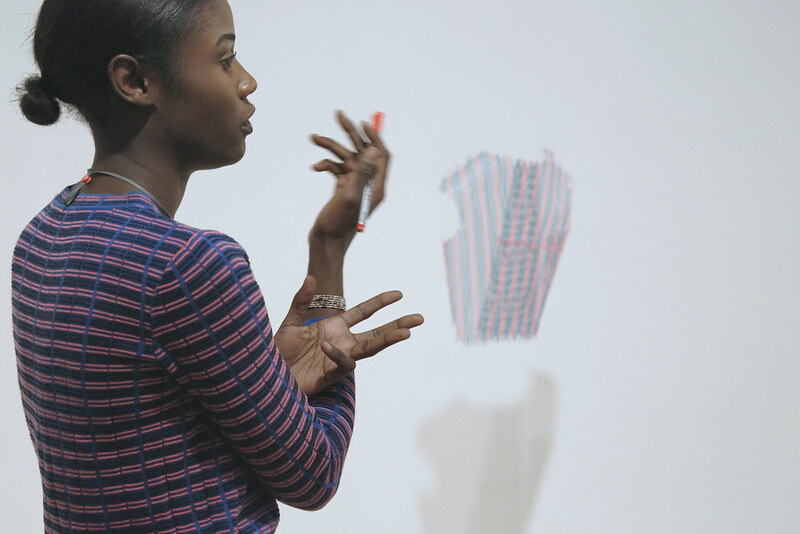 Associate professor of art Barry Perlus responding to the work of Richard Zimmerman (M.F.A. 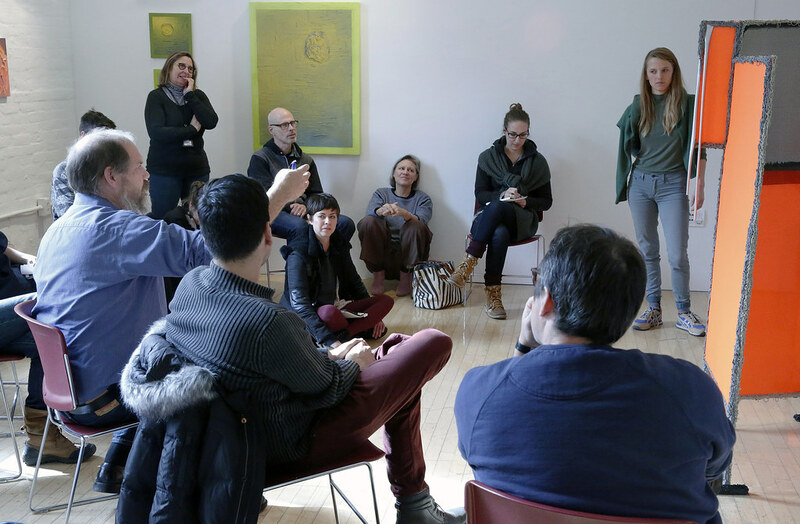 '18), during the all-faculty critique of the M.F.A. group show AFter karaoKE. 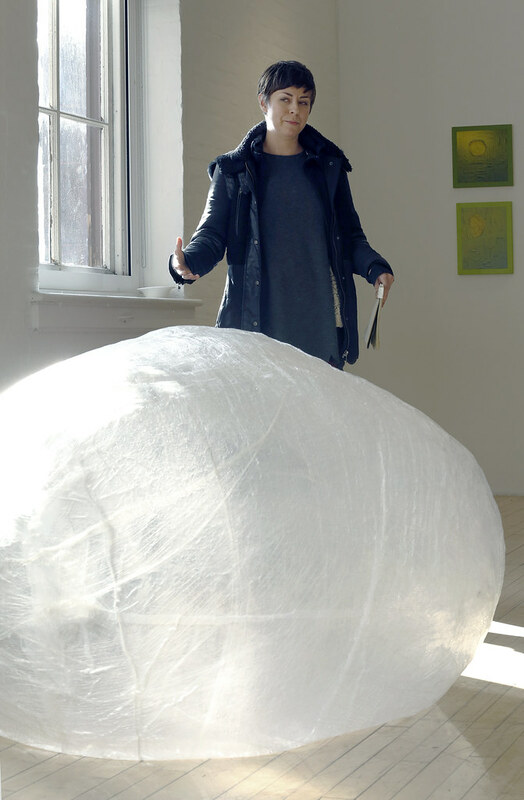 Department of Art Visiting Lecturer Christine Elfman during the M.F.A. all-faculty critique in Tjaden Gallery. Kaleb Hunkele (M.F.A. '18) presents his paintings during the M.F.A. all-faculty critique. 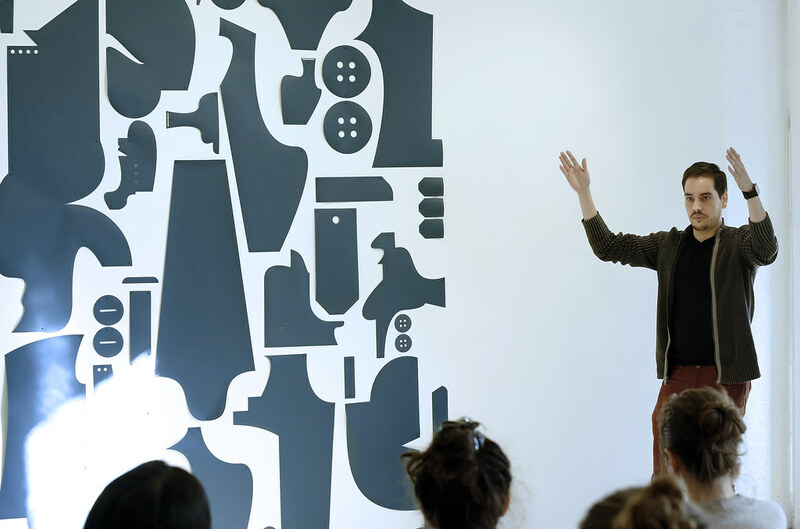 Associate Professor and Director of Graduate Studies Carl Ostendarp discussing the sculpture of Madeleine Cichy (M.F.A. '17) in the Experimental Gallery. Na Chainkua Reindorf (M.F.A. '17) presenting at the M.F.A. 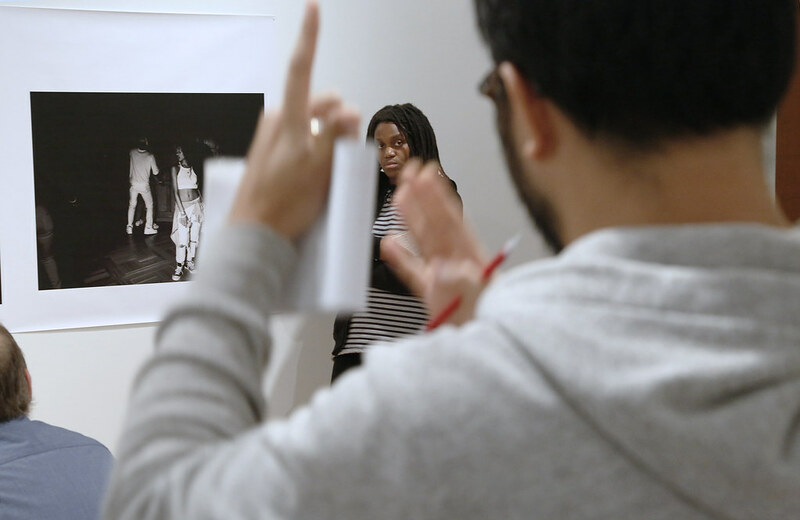 all-faculty critique in Tjaden Gallery. Clayton Skidmore (M.F.A. '17) responding to Kaleb Hunkele (M.F.A. '18) in the Tjaden Gallery. Jerry Lim (M.F.A. '17) responds to photographs by Sasha Phyars-Burgess (M.F.A. '18). Department of Art Chair and Associate Professor Michael Ashkin critiques the work of Madeleine Cichy (M.F.A. '17) in the Experimental Gallery. Gabriel Ramos (M.F.A. 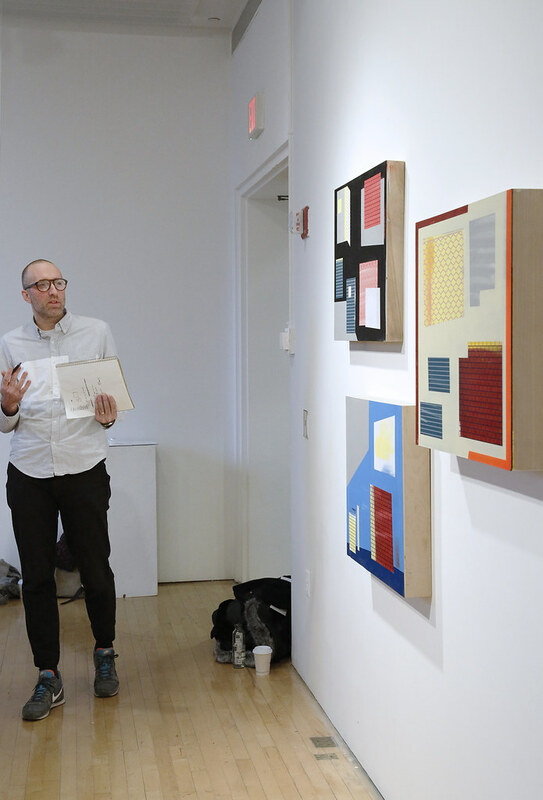 '18) discussing his work in the Experimental Gallery. Diana Clarke (M.F.A. '17) presenting her work in the Experimental Gallery. Alex Jahani (M.F.A. '18) presenting his paintings in the Experimental Gallery. Department of Art Visiting Lecturer Linda Norden, at right, during M.F.A. presentations in Tjaden Gallery. Kate Huffman (M.F.A. 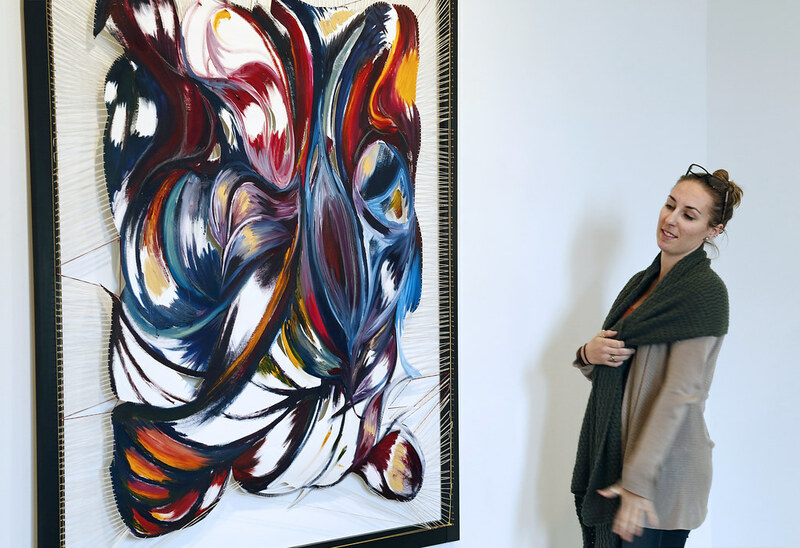 '18) with her painting in the Experimental Gallery. The two-year Master of Fine Arts (M.F.A.) 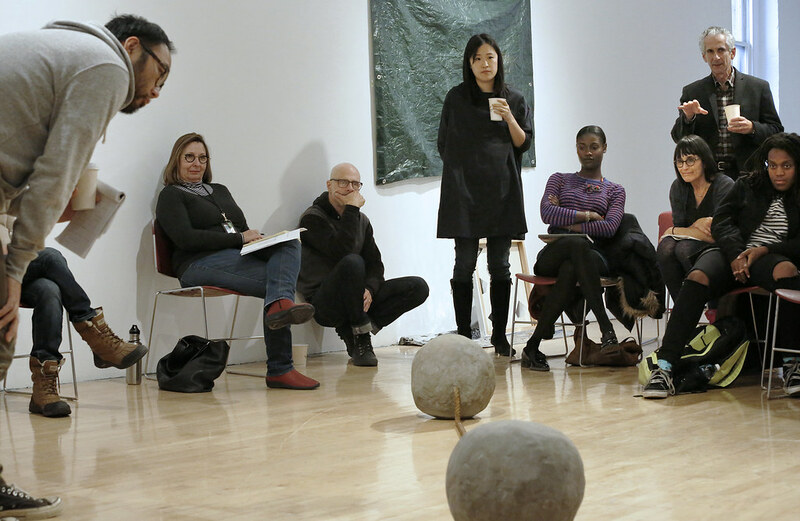 program in art encourages both interdisciplinary and medium-specific practices, and questions a pedagogy informed solely by Western models and traditions of art. The program is an intensive and intimate community which has an exceptional breadth and integration of its context. 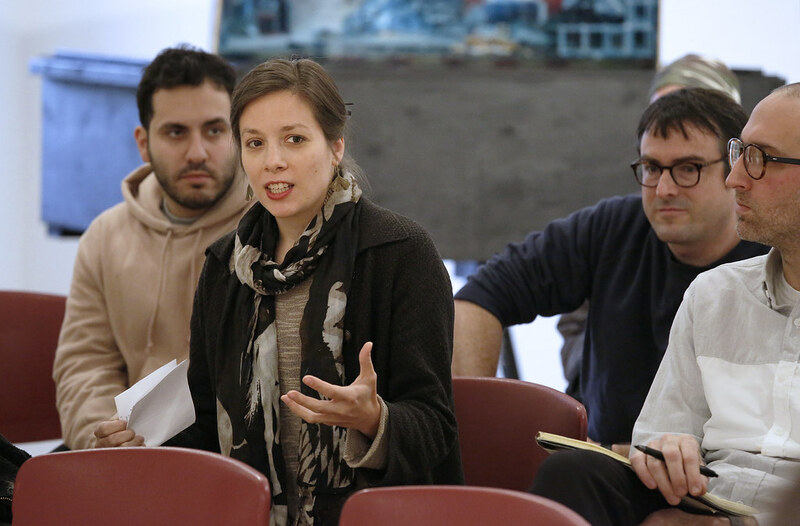 Each student works closely with a special advisory committee of their choosing that can encompass faculty members from across the university, allowing for a specialized and unique experience with limitless possibilities. Students interested in the M.F.A. program are encouraged to contact the program faculty members directly to ask questions and arrange an in-person interview.